Green gardens equipped with sun loungers lead right down to the Approdo Hotel's pebbles beach. This seafront hotel boasts a panoramic Sicilian restaurant and a quiet setting 10 minutes’ drive from Trapani. Guests can relax reading a free newspaper, while enjoying the morning buffet breakfast or having a break at the bar. Staff is happy to arrange trips to nearby attractions such as Erice, which is 15 km away. 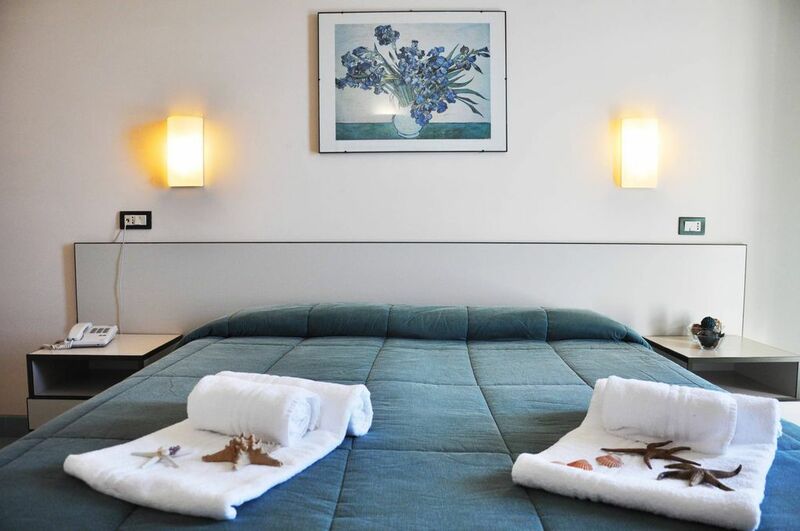 All air conditioned, guests' rooms at Hotel Approdo include a TV, safe and minibar. Some rooms also provide free Wi-Fi and some have a sea-view balcony. Pizzolungo is a port located in the western part of Sicily a few kilometers from Trapani, the western end of the Gulf of Bonagia. The name comes from a hill overlooking the whole area. From one part to the other you are deeply into the Nature: the Tyrrhenian Sea in one part and on the other hand is embraced by a luxuriant mountain range, it is situated on the slopes of Mount Erice. Distinguished not only for the typical Mediterranean climate, consisting of hot summers and cold winters, also for its historical background. Pizzolungo is, in fact, the place where according to legend Enea landed where his father Anchises died. It is seen, therefore, at the gates of the famous district "Stele of Anchises" erected in October 1930. Coming back a year later, Aeneas organized sports games in his honor. Almost all roads in the country are identified with names related to mythology, to the strong relationship it has with the ancient times.